Negotiate your way through any deal! In today's fast-paced business environment, where a single e-mail exchange can make or break your career, it's important that you know how to clearly and effectively discuss an agreement's terms in person as well as online. 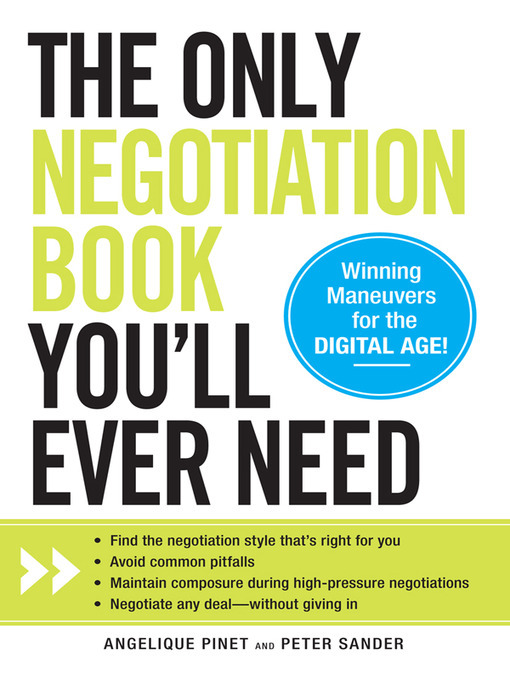 The Only Negotiation Book You'll Ever Need guides you through every stage of the process—from identifying opportunities to closing the deal—with useful negotiation techniques and tips for adapting classic strategies to online interactions. This book helps you anticipate your adversaries' moves, outwit them at every turn, and spin obstacles to your advantage. You'll also build long-term relationships and win your deals without ever having to give in. With The Only Negotiation Book You'll Ever Need, you'll finally be able to find a negotiation style that helps you get the outcome you want—every time!